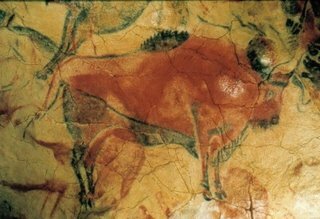 Prehistoric cave drawing of a bison, c. 10,000 years ago, approx life size, in Altamira, Spain. Public domain image from Wikipedia. I’ve never felt comfortable with the idea of visual art as a “language” with its own “vocabulary of marks”. “Language” and “vocabulary” are deeply ingrained in my psyche as words referring to speech and writing. However, I’m getting used to it, because in the contemporary art climate there’s no choice. And now I’m even beginning to see that it’s a useful concept. To see painting as a language is to realize that it takes time to learn, both as practitioner and viewer. A painting is more readily comprehensible on the surface than a page of Greek, it is true, and in this sense painting is a more universal language than verbal languages. But it still has its own forms and rules, tradition and history, allusions and illusions, and, yes, vocabulary of marks, that are there to be discovered and delighted in by the informed observer. On the other hand (as the liberal said), the visual arts may be becoming too verbal, too self-consciously intellectual, thereby losing touch with the wellspring of visual art, which is the desire to make marks, simply and literally; the same impulse that makes a child scribble on your nice clean wall. Thanks Katarzyna, it's good to know I'm not the only one! It still doesn't sit easily, the idea of a "vocabulary' of marks. And if every painter creates their own "language", isn't that like the Tower of Babel? I'm not worrying about it any more, just enjoying learning things like printmaking which has a new set of marks. i do think that art is a language and that such expression is not just individual, but cultural. the ideas of expression are unique to the individual but perhaps the vocabulary ok marks may have arisen out of the artist's social and cultural/religious context. Is it round or is it flat?